Лазурный Берег offers accommodation in Taganrog, 6 km from Gorky Park and 6 km from Chekhov Drama Theatre. It is situated 7 km from Durov Museum and offers free WiFi. ДОМ_у_МОРЯ_в_ДВУХ_ШАГАХ is an accommodation located in Taganrog, 5 km from Gorky Park and 6 km from Chekhov Drama Theatre. Free WiFi is provided. Featuring free WiFi and barbecue facilities, Guest House "Kazachka" near the sea offers accommodation in Taganrog, 5 km from Gorky Park and 5 km from Chekhov Drama Theatre. Offering a terrace, the property is located within 6 km of Durov Museum. Situated in Taganrog, 5 km from Gorky Park, Guest house Domashniy offers air-conditioned rooms with free WiFi. Providing barbecue facilities, the property is located within 5 km of Chekhov Drama Theatre. Nochnoy Kvartal is situated in Taganrog, 5 km from Chekhov Drama Theatre, and has barbecue facilities and a shared lounge. Located around 6 km from Gorky Park, the inn is also 6 km away from Durov Museum. Apartment On Dzerzhinskogo 192 is an accommodation located in Taganrog, 6 km from Chekhov Drama Theatre and 7 km from Gorky Park. It is set 7 km from Durov Museum and provides free WiFi. Situated in Taganrog in the Rostov region, Apartment on 4-ya Liniya 2 features a balcony. The accommodation is 8 km from the Chekhov Drama Theatre. 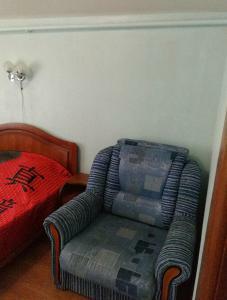 Located in Taganrog, Apartment on Dzerzhinskogo 193 provides accommodation with a balcony and free WiFi. The property is 6 km from Chekhov Drama Theatre. Located on the shores of the Sea of Azov in Taganrog, Hotel Priazovie features a private beachfront, an indoor and outdoor pool, a sauna, and an on-site restaurant serving European and Russian cuisine. Rooms at the property offer a minibar, a balcony, a flat-screen TV with satellite channels, air conditioning, and a private bathroom with a bath. This hotel features free Wi-Fi and has 2 indoor and 4 outdoor tennis courts. It is located 4 km from the Azov Sea in an attractive area of Taganrog. Set 6 km from Chekhov Drama Theatre and 7 km from Gorky Park, Apartment on Moskatova 27 provides accommodation situated in Taganrog. Guests staying at this apartment have access to free WiFi and a fully equipped kitchen. This hotel is located in the city of Taganrog. The Taganrog Congress Hotel offers 8 conference rooms, modern interiors with cable TV, and Wi-Fi is free in public areas. Elling Morskoi dom is set in Taganrog, on the coast of the Azov Sea. There is an on-site terrace located above the sea where guests can sunbathe and relax. 2 km from Gorky Park, Guest House Storm is set in Taganrog and offers air-conditioned rooms with free WiFi. The property is around 2. Apartment on 4-ya Novoselovskaya liter 4A, a property with a garden, is set in Taganrog, 2.7 km from Chekhov Drama Theatre, 3. Set in Taganrog, within 2.6 km of Chekhov Drama Theatre and 3. Apartments Crystal (L) has well-equipped accommodation boasting free WiFi in Taganrog, 1.7 km from Gorky Park. Situated in Taganrog, Apart-hotel Crystal Park & SPA features free WiFi, 1.7 km from Gorky Park and 2. Crystal Park Hotel & Spa offers accommodation in Taganrog. Every room at this hotel is air conditioned and is fitted with a flat-screen TV with satellite channels. Дом Панды in Taganrog provides accommodation with a garden and a bar. All rooms feature a kitchen, a flat-screen TV with satellite channels, and a private bathroom.